This card interacts positively with City of Traitors, while stopping fetch lands and Bazaar. Seems like it could fit in the 8 moon lists out there. Very interesting card. It also hoses Wasteland, Mishra's Factory, Library of Alexandria, and Azcanta, the Sunken Ruin. Not sure, but perhaps Ancient Tomb doesn't deal damage under Blood Sun. The only trick with Blood Sun is to figure our how it interacts with Blood Moon. For instance, when you have both in play what happens to fetch lands? Do they produce red mana or no mana at all? I’m pretty sure they tap for red mana. Blood Moon cares only that a land is non-basic, and doesn’t look at the land’s abilities at all. So regardless of the order of the two effects, (1) the land loses all abilities and (redundantly) all non-mana abilities, and (2) becomes a mountain and gains the mountain’s implicit mana ability. ah yes, it does get forbidden orchard. @evouga Is the Lotus vale comment correct? Perhaps I just dont get it but wouldnt it not work for the same reason you cant use it in response to the sac clause? In what cases is this better than Tsabo's Web? It certainly seems worse to build around. @vaughnbros Just one case among many: Wasteland's land destruction ability still works under Tsabo's Web, as long as it was untapped when the Web entered play and doesn't otherwise tap later. @bazaarofbaghdad So you are a ramp deck playing this to protect your lands? Obviously, though not previously mentioned, it hoses Fetches. Also Library of Alexandria. As previously pointed out, it hoses Orchard to the extent that it prevents Orchard from giving creatures, but Orchard still taps for 5 colors. This also interacts very favorably with Ancient Tombs which any deck running this would probably also use, and critically, it helps solve the biggest problem in Blood Moon decks - stopping them from finding that basic island. This also turns City of Brass into a no downside 5 color land... ??? (That is a question) Very, very interesting card. It doesn’t stop the damage from ancient tomb. The damage is part of the mana ability. Also replacement effects like Lotus Vale and Scored Ruins are not eliminated. 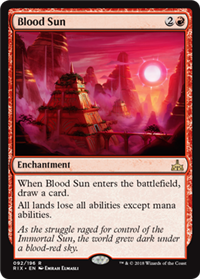 The major way this is different than blood moon is that fetch lands, Bazaar, etc don’t produce Red mana like they do under moon. But I think overall Moon is the stronger effect. This card is similar tsabos’s web in some regards. This card, while probably not something you would run next to bloodmoon effects, may be strictly better in some match ups in multiple formats. No mana from fetches is way scarier than red mana. I'll def be hoarding some copies and I think it could easily slot into existing modern and legacy lists. Also, does this hose cycler lands, riftstone portal, and the dredge land when they are not in play? I assume it does but I cant be sure, not so brushed up on m static effects rules. @protoaddct Good list, except Horizon Canopy is probably more hosed by Blood Moon than this. Arguable and situational most likely. Both cases it loses the sac outlet which really is the primary mode for the card. I think sun is likely worse for the other player because a) you drew a card and B) they still have to pay life for the mana. There are a lot of lands that sorta fall in a grey area though. FYI I am wrong. Under the new rules, this does allow Lotus Vale and Scored Ruins to enter the battlefield with no drawbacks. Lotus Vale + Blood Sun is neat but probably you're better off using Kazoo lands. They lose the bounce ability, and they're not quite as unplayable beforehand. Scorched Ruins, though, is a net mana gain even when you play it fairly. So... maybe? After Mishra's Workshop is restricted...? Also makes Lake of the dead do scary stuff. I think more practically it makes Crumbling Vestige produce 2 on the turn it enters. Every man land ever printed. If the rules allow Lotus Vale to enter the battlefield without restictions unders this card, then I assume those same rules mean Lotus Vale can be played under blood moon, put directly into play without sacrificing lands, and as a mountain. Is that right, can someone please confirm this.